There are some pretty great things about Jodhpur. One of them being the roof-top views from Heritage Kuchaman Haveli. We went back up to the roof-top restaurant for breakfast and discovered there was yet another set of stairs leading up to higher deck. 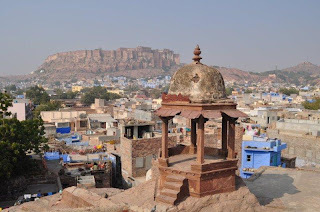 Our breathe was taken away at the sight of the city - Jodhpur, the blue city. It is an amazing 360 degree view with the imposing Meherangarh Fort in one direction; the Unmaid Palace another; and Jaswant Thada (a mini Taj Mahal) another. The best part though, was being able to check out the rooftop living going on all around us. The stone homes, two or three levels high, all have flat open decks on top where a lot of people spend their time at this time of year - winter. For us it is warm and wonderful, for the locals it is cold and the roof is where they go to warm up. Everything happens here. Laundry is hung to dry, children play catch, and ride tricycles. One neighbour makes clay pots and and paints wooden figures. I feel like I am spying on everyone, especially an older couple who are just sitting together. But when the woman sees me with my camera in hand I put it down and wave. She immediately smiles, gets up and points to me to take her photo. Absolutely! Which leads me to the other great thing about Jodhpur - the people are incredibly friendly and everyone asks me to take their photo. Not only do I feel like a rock star (just because I'm white) but now I feel like a rock star photographer. As soon as we hit the streets everyone from children to adults start posing for me. And as soon as I take one photo, piles more people want theirs taken too. I actually had a rickshaw driver pull over and motion to me to take his photo. We walked to the clock tower and the market, full of everything from fruit, veggies, and spices to clothing and turbans and bangles. We found a really good rooftop restaurant for lunch: Pal Haveli, and a good little coffee shop next door to sip espresso and watch the people go by. The narrow streets are full of cows and donkeys and the odd camel. Some homes are colorful and nicely carved on the outside, others are decrepit inside and out. They are all lacking in material goods but full of life. Back at our haveli for sunset and a beer on the rooftop. i found ur blog while searching for jodhpur site visits..